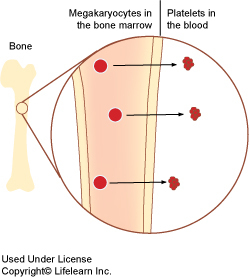 Platelets are fragments of cytoplasm from cells calledmegakaryocytes that are produced in the bone marrow. Platelets clump together to seal broken or leaking blood vessels and prevent blood loss. They are an important factor in the blood clotting mechanism, and thrombocytopenia can lead to spontaneous bleeding or bruising. This condition is easily diagnosed with a simple blood test. Platelet counts are often performed in conjunction with a complete blood cell count (CBC). Platelet counts of less than 20,000 to 30,000 per microliter of blood (normal platelet counts are 175,000 - 500,000) make spontaneous hemorrhage likely. Additional diagnostic tests are used to investigate the underlying causes of the problem. If blood loss is acute or sudden, a blood transfusion may be required to stabilize the patient. Usually, other treatments are aimed at the underlying causes of the problem. Yes, if platelet function is impaired. This can be a side effect of a number of drugs including some antibiotics. There are inherited platelet defects such as von Willebrand's Disease (see separate handout on this topic), that are common in certain breeds of dogs, especially Doberman pinschers. Congenital platelet defects also occur in Otterhounds, Great Pyrenees, American Cocker Spaniels and Basset Hounds. Diagnosis requires tests of platelet function. There are no specific treatments other than transfusions as needed. Thrombocytopenia is a term that refers to a decrease in the number of thrombocytes or platelets circulating in the blood. 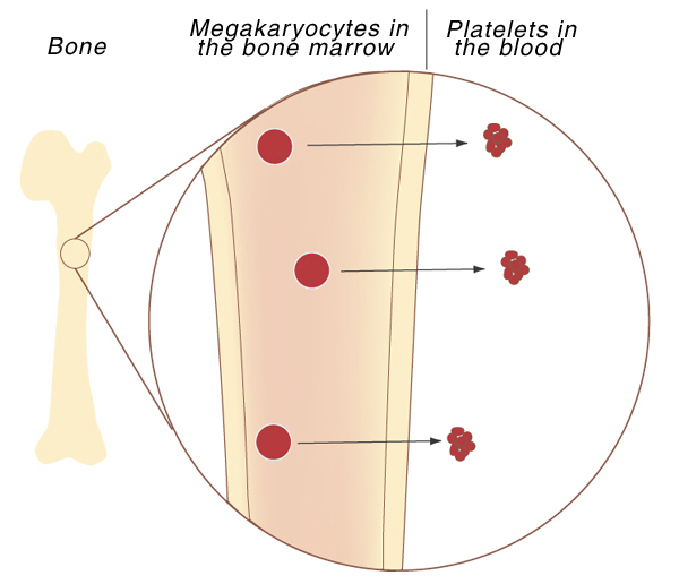 Platelets are fragments of the cytoplasm of cells called megakaryocytes. They are produced in the bone marrow. Platelets clump together to seal broken or leaking blood vessels and prevent blood loss. They are an important factor in the blood clotting mechanism, and thrombocytopenia can lead to spontaneous bleeding or bruising. Any severe or prolonged blood loss, increased internal destruction of platelets, or impaired bone marrow production can lead to acute (short-term) or chronic (long-term) deficiency of platelets. Many severe diseases have thrombocytopenia as one component of the condition. For example, certain infections, neoplasia (cancer), immune system disorders and pancreatitis can result in thrombocytopenia, as can drug therapies such as some anti-cancer treatments. Thrombocytopenia is quite common. Some surveys have shown as many as 1% of cats admitted to veterinary hospitals are platelet-deficient. This condition is easily diagnosed with a simple blood test. Platelet counts are usually performed as part of a CBC or complete blood count. "Additional diagnostic tests are used to investigate the underlying causes of the problem." Platelet counts of less than 20,000 to 30,000 per microliter of blood (normal platelet counts are 175,000-500,000) make spontaneous hemorrhage likely. Additional diagnostic tests are used to investigate the underlying causes of the problem. If the blood loss has been acute or sudden, a blood transfusion may be required. Usually, other therapeutic treatments will be aimed at the underlying causes of the problem. Yes, this can happen if platelet function is impaired. This can be a side effect of some drugs, including antibiotics. Cats can be affected by inherited platelet defects, such as von Willebrand's Disease (see separate topic), although this disease is rare in cats. Another example is Chediak-Higashi syndrome, a condition identified by partial albinism (lightly colored iris of the eye), and seen in some lines of Persians and other breeds. Diagnosis requires tests of platelet function. There are no specific treatments other than transfusions as needed.